Somma di arithmetica, geometria, proporzioni e proporzionalita. Prelim: Fa. Pompilius: Epigramma ad lectorem. 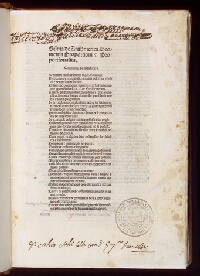 Giorgio Sommariva: Epigramma ad auctorem (I, II). 16th-century wooden boards, modern calf on the spine, clasps missing, catches intact. 308 leaves; a number of woodcut initials and diagrams, a woodcut historiated initial capital and woodcut border decoration on a1r. Accademia della Valle Tiberina Toscana (stamp; π1r).